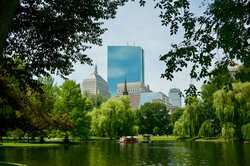 Looking for Boston Marathon lodging? We still have some rooms available for individuals and families over the race weekend at Irving House for this year’s race. It’s one of the most vibrant times to visit Boston and Cambridge. Watch 30,000 Marathon runners who brave hilly New England terrain and unpredictable weather reach the city of Boston and cross the finish line. The course runs through 26 miles (42.195 km) of winding roads. It starts in the western suburb of Hopkinton, follows Route 135, Route 16, Route 30 and city streets into the center of Boston. The official finish line is located at Copley Square, alongside the Boston Public Library – easily accessed by our metro system, the “T”. See the Route Map. 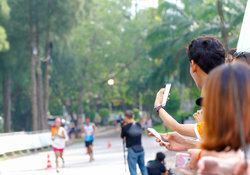 Irving House is an ideal place to stay to watch or take part in the Boston Marathon. Hop on the T (aka our Metro) in nearby Harvard Square for a quick trip to many points along the race, including the finish line in Copley Square. BOOK DIRECT for availability and rates. Besides enjoying New England spring on a festive day, you will also be part of a great Boston tradition as the marathon started here in 1897! The Marathon is New England’s most widely viewed sports event. Irving House is located a short walk to the Harvard Square “T” station for easy access to downtown Boston, just across the Charles River from Cambridge. The race starts 26 miles from Boston in Hopkinton, MA. 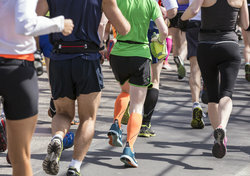 The Boston Athletic Association has embraced a proud tradition of extending the challenge of the marathon to people with disabilities. There are several staggered starting times depending on the racers’ competitive category: Mobility Impaired, Men’s and Women’s Push-Rim Wheelchair, Handcycle, Elite Women’s, Elite Men’s, Wave Two, Wave Three, Wave Four.